Quinoa and cabbage are great together. Add carrots for colour, celery for crunch, lightly sauté it all with sesame oil and aminos, and you have a hearty and delicious veggie meal. The Cadet tore into his bowl, bits aflyin', and G-man needed each bite to be assembled with at least one piece of celery. Quinoa and preschoolers can be a pretty messy combination but well worth the clean-up to have them eat lots of vegetables. Bring the quinoa and water to a boil in a lidded sauce pan. (I use an "Ultimate" pan for just about everything.) Keep boiling for about five minutes, then put the cover on the pan and turn off the heat. Allow it to sit for fifteen minutes while you chop your vegetables. In a sauté pan (or the same "Ultimate"pan,) pour the sesame oil and aminos. 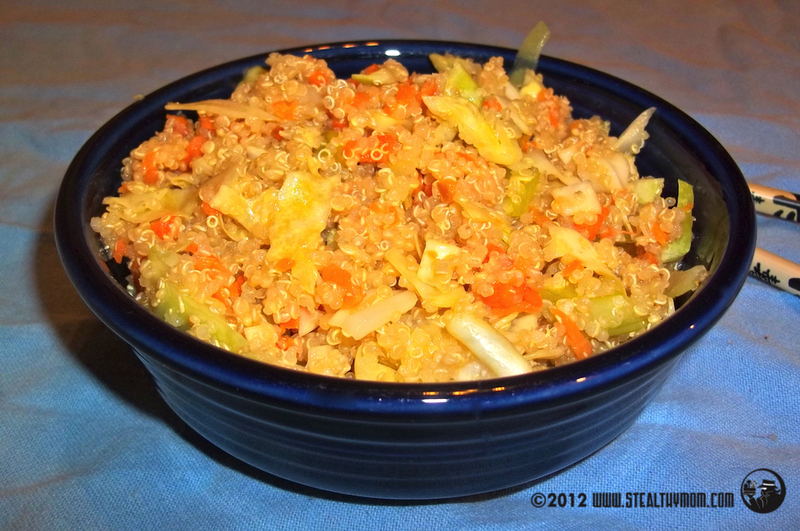 Stir in the quinoa until it is coated. Add the cabbage and cook for about five minutes. Turn off the heat and add the carrots, celery, and salt. Give everything a toss and serve it up. I shared this recipe with Monday Mania, Meatless Mondays and Fat Tuesday.